o the technology, GSM, CDMA, SIM etc. o What does wireless mean to the human experience? o Who are some of the early players in the wireless web access developments? o Who’s Making Money in Wireless? In class we may have a conversation about how humans try to develop technology and systems that strives to replicate, as much as possible, the true human experience, involving all senses, in communication. A video, discussing this points has been posted on YouTube 2009 Feb 02. Many of the things we discuss in this unit on m-commerce are consequences of how human develop technology to replicate the human experience. We have many examples from history – humans developed the concept of the photograph to more accurately represent the human face because artists’ renditions were not perfect. Because humans see in colour, it was natural that humans would then develop colour photography. Since we do not see just static images, but rather moving images, it is natural that we would learn to create moving images. And since humans like to see and hear what they sense, it is logical that we would be able to add sound to moving pictures. 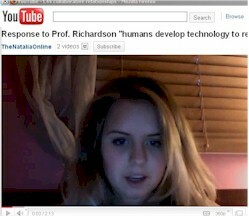 Related Videos Natalia W. in MGD415 at UTM in the 2nd week of March 2011 created this 2 min video in response to my video discussing how humans develop technology to replicate the human experience.Natalia made some interesting observations based on an article she read in the Wall Street Journal about bendable screens. and Samsung debuts a bendable smartphone screen at the CES show in Vegas. Queen’s has a YouTube video explaining how it works.